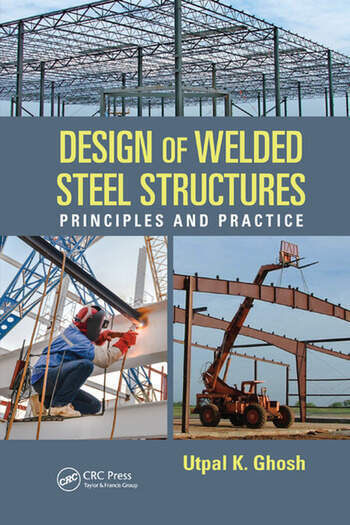 Design of Welded Steel Structures: Principles and Practice draws not only from the author’s own experience, but also from the vast pool of research conducted by distinguished engineers around the globe. Detailed bibliographies are included at the end of each chapter. Utpal K. Ghosh worked, among others, with Freeman Fox and Partners, London; Sir William Arrol & Co. Ltd., Glasgow, Scotland; and Braithwaite Burn & Jessop Construction Co. Ltd., Kolkata, India, after graduating in civil engineering in 1954 from Bengal Engineering College, Shibpur, Calcutta University (currently Indian Institute of Engineering Science and Technology). Subsequently, he set up his own practice as a consulting engineer. During his long career, he participated in the planning, design, fabrication, erection, and overall management of a wide variety of projects, such as bridges and industrial structures, which included new construction as well as repair and rehabilitation work. He has worked on projects in several countries, including the United Kingdom, New Zealand, Malaysia, Indonesia, Singapore, and India. He has published a number of articles and is the author of two books titled Design and Construction of Steel Bridges and Repair and Rehabilitation of Steel Bridges. He is a Chartered Engineer, a Fellow of the Institution of Engineers (India), a Member of the Institution of Civil Engineers (UK), and a Member of the Institution of Structural Engineers (UK). "… an important tool for designers, fabrication industry members, and industry developers across geographical borders. … The author has done extensive study and research of available literature on the subject and presented the relevant day-to-day use information in an encapsulated, easy-to-implement format, ready for practical hands-on users." "… covers important practical design aspects of welded steel structures that are typically not covered in analytical-based design references." "The author has done a commendable job. … He has filled a gap in this field. The book is highly useful for professionals working in the area of welded structures. Postgraduate students will enjoy reading a concise and well-written textbook. "The author is to be congratulated on this succinct and unique introduction to so vast a subject based on his experience of over 60 years. This book is principally aimed at the structural steel design engineer. However, the publication does not focus exclusively on structural analysis and design. The related areas of materials, welding, fabrication and inspection have also been convered in conjunction with structural analysis and design." "Ghosh is a practicing engineer with more than 50 years of experience in structural engineering and has authored two other books on steel construction, Design and Construction of Steel Bridges (2006) and Repair and Rehabilitation of Steel Bridges (2000). Here, he provides comprehensive coverage of theory and practice for welded structures including plate girders, portal frames, trusses and lattice girders, quality control, and construction costs. Each topic is covered in a separate chapter. This is not intended to be a textbook—no worked examples or homework problems are included. The book would serve well as a reference for practicing engineers. However, it would be of limited value to undergraduate engineering students because it lacks references to engineering code requirements. In addition, all illustrations are in the form of engineering drawings, which would be difficult for undergraduates with limited construction experience to understand." "…a well-written, clearly illustrated book containing a wealth of experience and practical guidance on the application of welding in steel structures. Undergraduate students and engineers approaching the topic for the first time will find it contains much useful information and provides an excellent introduction to this important topic."